Opening presents on Christmas morning can be a very exciting time. 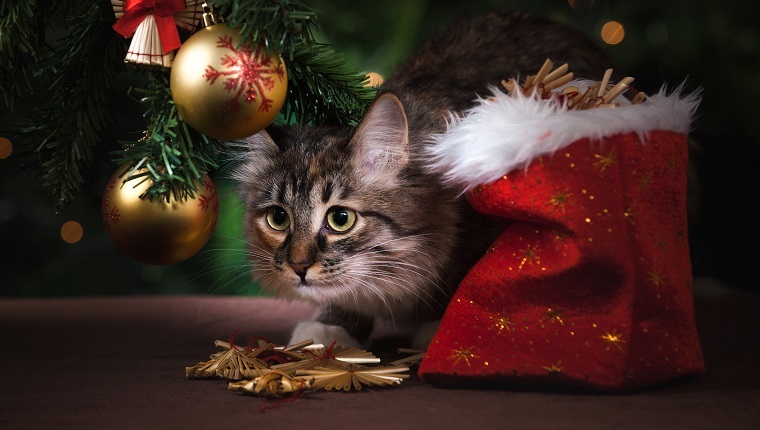 However, make sure you don’t leave your kitty out of the gift giving experience–they are a part of your family, after all! Not only will your cat feel more loved, but their reaction to getting gifts will be priceless and definitely make your Christmas ten times better. You’re going to want to have the camera ready because when cats open presents, they do it in very dramatic fashion. Merry Christmas to you and your cats! Toka is excited about his Christmas present because there’s a special gift inside the wrapping–catnip! Toka is an extremely smart kitty, and instead of looking to his owners to see what he should do, he figures it out on his own. After a few seconds of trial and error, Toka holds down the present and rips it open with his teeth. He opens his gift all by himself and is very happy with the result. The best part is his fellow cat friend just lounges and stretches in the background, as if he knows not to get involved with Toka’s present. It’s Christmas morning for these cats, which can only mean one thing: it’s time to open their stockings, of course. Their owner has decorated three personalized stockings for his kitties, but once the cats start tearing into their stockings, the decorations don’t seem to matter. They start ripping and tearing, as cats do. Being cats and all, they seem to be more interested in the decorations on the stockings themselves then the actual toys. It’s Wampa the kitty’s first Christmas and first time opening her present. However, Wampa has to share Christmas with her doggy friend, which means the gift opening becomes a team effort. When Wampa opens her gift, her dog friend is there, ready to be of assistance. After some team effort and back and forth, Wampa and her dog friend eventually open the present. However, it seems that Wampa is more interested in playing with and attacking her buddy than her actual present! Charlie the cat is definitely ready for his Christmas present. He’s not playing around with his gift and knows exactly what he wants and how he is going to get it. He doesn’t just calmly inspect his gift, but rather goes straight in for the kill. He starts biting and ripping and tearing the present, kicking it with his back legs like it’s a toy, itself. Just like any other cat, he gets distracted along the way by the paper. However, in the end, he gets his gift and is just as excited about it as he was about actually opening it. This kitten is opening Christmas presents for the first time and needs a little assistance. He is a bit unsure of what do, so his owners step in and help him tear the first gift open. Then, kitty realizes what Christmas presents are all about. By the time he gets the second present, he’s ready to go. He immediately starts tearing into the present, ripping the paper all by himself, making a huge mess in the process and leaving shreds of paper everywhere. Kitty was so excited, though, and it was his first Christmas. How can anyone be mad? Harvey the cat absolutely loves Christmas. He’s determined to open his Christmas present, no matter what. Harvey is super focused and never takes his eyes off the prize. The way this cat opens gifts shows just how much of a pro at Christmas he really is. Harvey has definitely opened many Christmas presents in the past based on his skills. He never loses track of what his mission is and never gives up on his present. After lots of persistence, he has success! He definitely could teach some other cats the art of opening presents. Frosti, the black and white kitty, and Choco, the white kitty, open their Christmas present with some teamwork. At first they both inspect the present with their noses, as cats do. After consulting together on what the next best move is to tackle the present, together they decide that maybe their owner should help them out. With some extra assistance, these two cats learn that the mystery item wrapped in the paper is actually something they want to play with after all–an infinity cat toy! Teamwork does pay off. Jasper the cat loves his Christmas present so much that he won’t let go. After successfully tearing into his gift and biting and ripping the paper, his owner wants to take the present so she can unhinge it from its package. Jasper, however, is probably thinking, “I worked so hard to open this present, please don’t take it away from me!” Jasper is so excited that he is already ready to play, but what he doesn’t realize is that the gift is still attached to the cardboard. His owner hilariously tries to pull it away, but, alas, does not succeed. Jasper amusingly does not realize that she is only trying to help. It’s time for Fendi the Bengal cat to open his Christmas presents. However, instead of just opening his present, Fendi turns the actual opening into a game, itself. As he rips open the present, he decides it’s more fun to bite and chew the paper rather than continue opening it. The struggle of every owner is whether their cat would rather have paper for Christmas than their actual gift! For his second present, Fendi won’t open it unless it’s made into a game, of course, so his owner hides under the present and makes it move, tempting Fendi to attack it. I mean, a gift isn’t fun to a cat unless it’s moving, right? This cat is not messing around with Christmas. He doesn’t just open his present peacefully, but instead starts attacking it like it is some type of creature he’s trying to kill! He holds on to the present like it’s his prey, wagging his tail, kicking it with his back legs, and biting it ferociously. Don’t get this cat something expensive for Christmas because you’ll be wasting your money. Any gift that gets into this cat’s paws will be instantly destroyed. Did you get your cat a Christmas present this year? Did your kitty open their gifts on their own? Let us know and leave a comment below!